Hi everyone, it’s Hannah, Tiffany’s daughter here! I feel like we’ve been making a lot girl themed blankets lately (probably because there is so much lovely blush and peach colors all over Target right now that we can’t get enough of), so a few weeks ago I decided it was time to try making a blanket for a baby boy. I’ve had this beautiful Caron Simply Soft Light Country Blue in my yarn basket that I’ve been wanting to use forever, but I couldn’t ever come up with an idea that I liked. A few months ago my mom posted the double crochet v stitch on her daisyfarm.stitches Instagram account and I’ve been wanting to try it ever since I saw it. 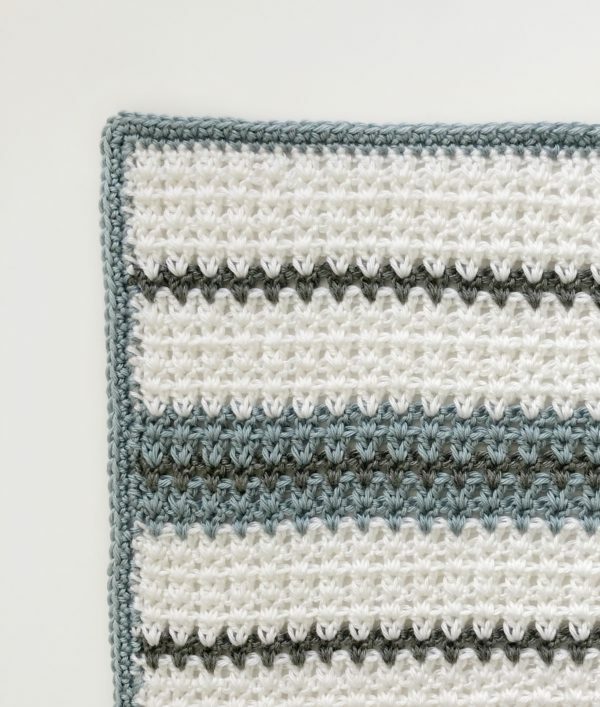 I think it’s actually a great beginner stitch once you’ve mastered double crochet because it’s pretty easy to always see where you need to insert your hook. I love how even the lines turn out and I love that the v stitches make the stripes look like small chevrons, so I decided to give it a shot and finally use my blue yarn. I actually started this blanket over several times because I couldn’t figure out a color combo and stripe pattern that I liked. I thought about adding in a nice gold/mustard color to give it a more modern look, but the mustard just didn’t look right with the bright white. So I decided to just keep it simple with the blue, white and gray and I think it ended up with a really nice modern feel for a baby boy room. One thing you should know about this stitch is that it does work up quite loose because of the gaps between the v’s so you may want to do a quick practice swatch and experiment with hook sizes. I tend to crochet loose myself, so I probably could have gone down a hook size (I used an H), but instead I just tried to watch myself and keep things tight as I went and I think it turned out fine. Chain 100 in White (or any even number). ROW 1: In the fourth chain from the hook work 2 DC. SK the next chain space, *DC 2 in the next chain space, then SK the next chain. * Repeat * across the row and work one DC into the very last chain. Chain 3 and turn. (This will count as your first DC) on the next row. ROW 2: Work 2 DC in between each pair of DC from the row below. Insert your hook into the space between them. Repeat across the whole row and end with one DC into the top of the first chain three. Chain three and turn. Continue repeating row 2 for the rest of the blanket. Here is a close-up picture of the stitch. You can see that that two double crochets always go in between the two double crochets from the previous row. Repeat from the beginning until you reach your desired length. For the size I made, I ended up with four rows of blue stripes when I finished. Tie off and weave in all ends before starting the border. For this blanket I decided to just keep it simple and work two rows of single crochet around the edge. Pull up a loop with blue in any corner. Work one SC in that space. Work SC around the entire blanket keeping your stitches to about 2 per each block of color on the sides. Check your work often to prevent rippling and adding too many stitches. Work 3 SC into each corner space. When you return to the starting corner, work remaining two SC and slip stitch to join and tie off. 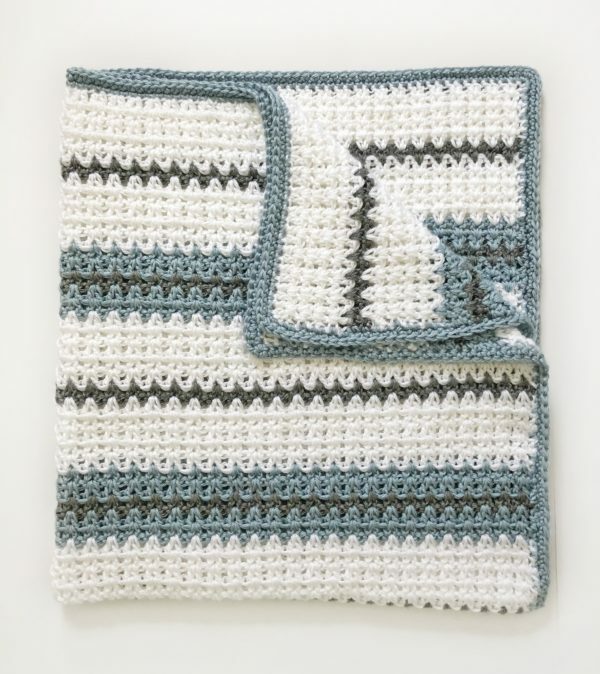 I hope you enjoy making this double crochet v stitch blanket! It really is a fun stitch to work with and a good one if you don’t want to concentrate too hard and need a nice Netflix project :). I think there are a lot of cool stripe and color combinations that would look good with this stitch, so I hope you’ll share your creativity with us on Instagram! Be sure to use #daisyfarmcrafts – we’d love to see your work! Wondering how you ended up with 4 rows of blue at the bottom? 4 rows of blue isn’t even in he patternn description?